There are certain veggies and recipes that I love, but have stooped making it (or buying), because the other members of the family are not so fond of it. The moment I saw Soma's Radish and Mint Salad, I had this certain urge to rush to a grocery store to buy these reddish-purplish cuties. They brought back memories; memories close to my heart. Back in India, Radish (Mooli in Hindi and Mulo in Bengali) is mostly white, long and slender. In Kolkata (née Cacutta) during the winter months we used to get red skinned radishes called "Ranga Mulo" for few weeks only. They were also oblong and more flavorful than their white counterparts. Though it had the characteristic pungency of the white radishes, they also had a sweet undertone. Though, the cute round ones that we find here is the US, looks different from their slender white Indian cousins, they taste exactly the same. Crisp and pungent. Radish is definitely not my most favorite vegetable on the planet, but its something I like. I have always enjoyed radish in its raw state rather than its cooked form. Though most people shy ways from this vegetable because of its strong flavor, pungency and spiciness, they are the exact reason for my fondness. I can munch any veggies (eatable in its raw form), with a squirt of lemon juice and a sprinkle of freshly cracked black pepper and rock salt. Frankly, that's my favorite and mostly used salad dressing. The lemon juice mellows the pungency of the radish and the ginger enhances its spiciness. The zing from the rock salt just livens everything up. The more it sits, the more cohesive are the flavors. Just like a pickle. But don't let it sit for long. 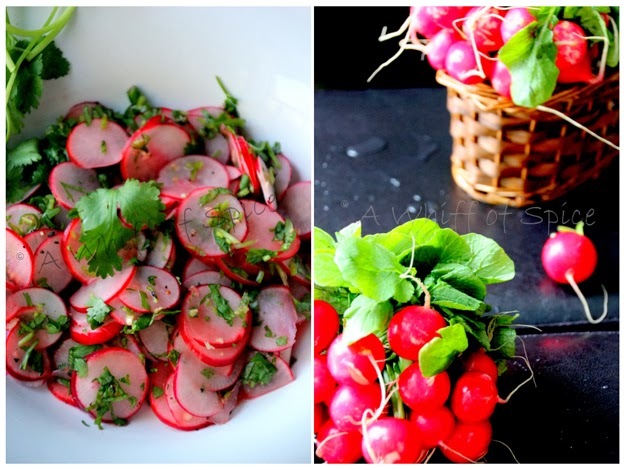 You don't want to loose the crispiness of the radishes. 30 mins to an hour should be good enough. See the liquid at the bottom of the salad. Tangy, salty; its the essence of the salad. Never throw it away. It the best part of the salad. Slurp it, smack your lips... That's how you should have it. From being a side to a simple meal of roti-sabzi or dal chawal to topping your wraps and taco to more elegant grilled fish and meat, this salad is truly versatile and perfect for the upcoming summer months. 1. Wash the radishes thoroughly. Pat dry. Slice as thinly as possible. 2. Chop the coriander leaves/ cilantro very finely. 3. Finely mince a tiny piece of fresh ginger. I like getting tiny bits of ginger, while chomping down my salad. If you are not a fan, grate the ginger and add around 1/4 tsp of its juice. 5. In a separate bowl, whisk together the lemon/lime juice, minced ginger (or its juice), rock salt (or coarse sea salt or Himalayan pink salt) an a teeny bit of sugar. 6. Pour over the radish and toss well. 7. Let it stand for 30 minutes to an hour before serving. I like to keep it covred at room temperature, but it can sure be refrigerated. My usual simple salad - the one I grew up eating! Colourful and healthy looking salad. Excellent pics to look at. Thanks Deepa... you are so sweet!